This issue of The Minerva Reader features a stellar debut collection by Justin Lauzon, this is why we're made in the dark (Quattro). Justin launched his book during the blizzard of the year but had a great turnout regardless and it was a fabulous evening! Writer for a year (aka me!) was there for the event. I hope you will enjoy the review below the large pic of to-read books! And, so far, here's a stack of my Minerva To-Read Books! I am hoping to read and feature each of these books during this year (and add many more to the list!) but, following this post, I must go on a hiatus and work on the self-edits of The Occult Persuasion and The Anarchist's Solution! Last year, I made changes to Rotten Peaches to the 11th hour and that will NOT happen this year! 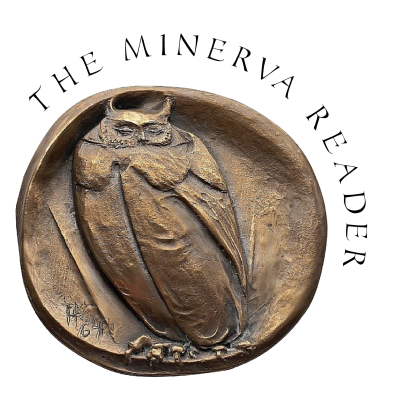 So off I will go, put my head down and polish the book, following which, The Minerva Reader shall reappear! this is why we are made in the dark wrestles with the idea of transformation. The poems alternate between lyrical and narrative; they explore the way changes in the physical world and language mirror each other through an extravagance of subjects: colour, the city, maps, bodily transformation, astronomy, weather, and celestial objects. If I hadn’t met the author and was asked to describe him, I’d say he’s a kindly European gentleman, Spanish perhaps, thin, in his eighties, a fine-looking man, serene but strong. A great-grandfather and lover of life, a sensual man, loving to his children, stern at times, judicious and mathematical. A man careful with his words, a thinker, an observer, a man who sees the worlds behind the closed curtains of our lives. This is how I would imagine the author of this is why we’re made in the dark. And if you’ve had the pleasure of meeting Justin, you’d know he is a young man, with his whole life before him. It's just that the poems are so layered and so intense that it’s a wonder they’ve been written by one so young. Luciano Iacobelli spotted Justin Lauzon at an open mic reading and urged him to work on his collection and it’s easy to see why. This is a collection I will return to often. from the end of the road. like a city in grace. and crawl to the red, red rooftops. but the second has never run. must be hard to keep). "And if a writer has genuine star quality, a sharper, deeper radiance than most, then he or she ought to be identified and celebrated without delay. Time may be of the essence. Margaret Macpherson, a relatively unknown Maritime-born Albertan, is such a writer, and Body Trade, her seventh book and second novel, is the proof. She writes with the psychological insight of Carol Shields, the gravitas of Margaret Atwood, the poetic reflexes of Earl Birney and the earthy eroticism of Leonard Cohen, but her voice remains uniquely her own."